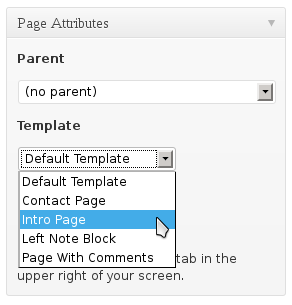 We have added a page template called “Intro Page” which has no header or content area. This is perfect for showing off your background images or video. To create a page like this, add a new page in WordPress and at the right hand side there is a box named Page Attributes. Under Page Template choose Intro Page. If you want the Skip intro button on the page to go to somewhere other than the homepage, enter the URL in the Skip intro URL field in the page metabox settings.